Tropical Depression 6 developed in the far eastern North Atlantic Ocean and NASA and NOAA satellites provided infrared and visible views at the storm. The Global Precipitation Measurement mission or GPM core observatory satellite collected data as the newest Atlantic Ocean tropical depression was forming on August 16, 2016 at 4:31 p.m. EDT (2031 UTC). GPM data showed that the forming tropical cyclone was getting organized. A strong band of rainfall south of the center of the low's circulation was shown with data from GPM's Microwave Imager (GMI) and Dual-Frequency Precipitation Radar (DPR) instruments. DPR measurements found that an intense shower in this band was dropping rain at a rate of over 155 mm (6.1 inches) per hour. GPM's radar data (DPR Ku Band) data was used to create a 3-D slice through the forming tropical depression. The 3-D image, created at NASA's Goddard Space Flight Center in Greenbelt, Md. showed intensity and heights of precipitation in some tall storms reached heights of over 15 km (9.3 miles). The Atmospheric Infrared Sounder or AIRS instrument that flies aboard NASA's Aqua satellite analyzed the depression within an hour after it formed. 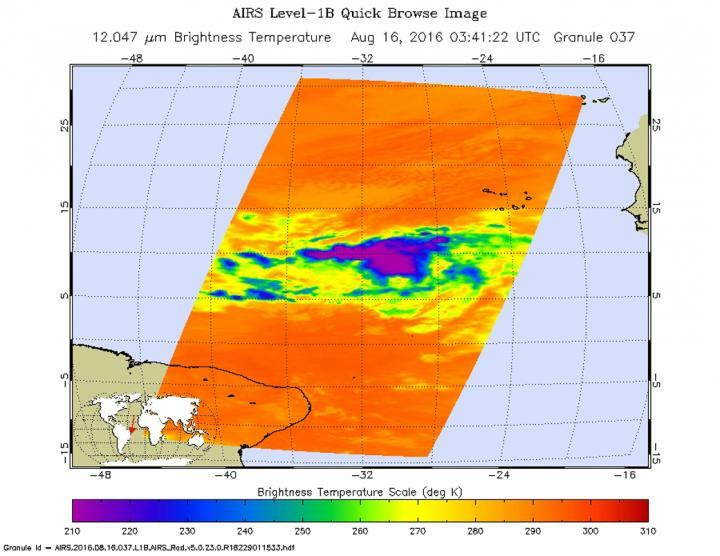 AIRS looked at Tropical Depression 6 (TD6) in infrared light on Aug. 16 at 11:41 p.m. EDT (0341 UTC on Aug. 17) gathering temperature data of the system's clouds. Strong thunderstorms were seen north of the center of circulation where cloud top temperatures exceeded minus 63 degrees Fahrenheit (minus 53 degrees Celsius). Storms with temperatures that cold are high in the troposphere and NASA research has shown they have the ability to generate heavy rain. On Aug. 17 at 11 a.m. EDT the National Hurricane Center discussion noted "The depression's overall cloud pattern and low-level wind field have continued to improve, although cloud tops have warmed considerably near the center since the previous advisory." 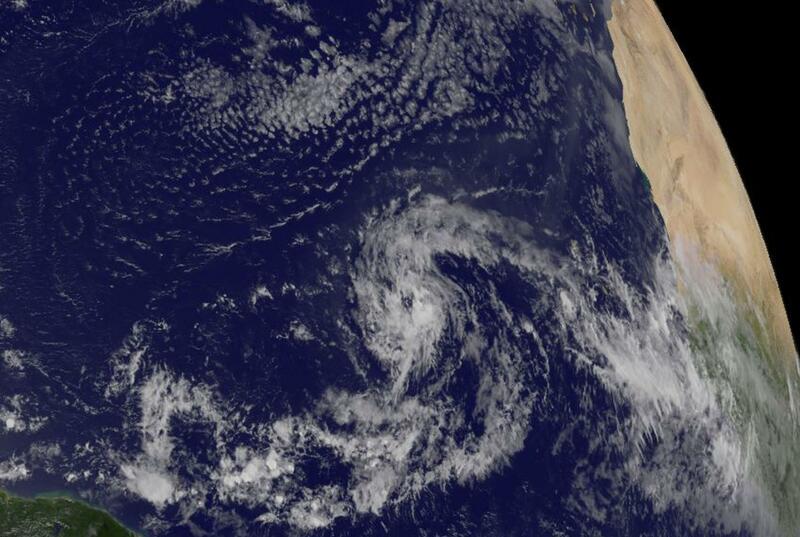 NOAA's GOES-East satellite captured a visible image of Tropical Depression 6 in the far eastern Atlantic on Aug. 17 at 10:45 a.m. EDT (1645 UTC). NOAA manages the GOES series of satellites and the NASA/NOAA GOES Project at NASA's Goddard Space Flight Center in Greenbelt, Maryland uses the satellite data to create images and animations. At 11 a.m. EDT (1500 UTC) the center of Tropical Depression Six (TD6) was located near 14.0 degrees north latitude and 36.4 degrees west longitude, about 840 miles (1,350 km) west of the Cape Verde Islands. The Cape Verde islands are made up of two small archipelagos, located about 400 miles off of Africa's west coast. The National Hurricane Center (NHC) said that the depression is moving toward the west-northwest near 15 mph (24 kph) and this motion with some decrease in forward speed is expected during the next couple of days. Maximum sustained winds are near 35 mph (55 kph) with higher gusts. Slow strengthening is forecast during the next 48 hours, and the depression is likely to become a tropical storm today, Aug. 17.